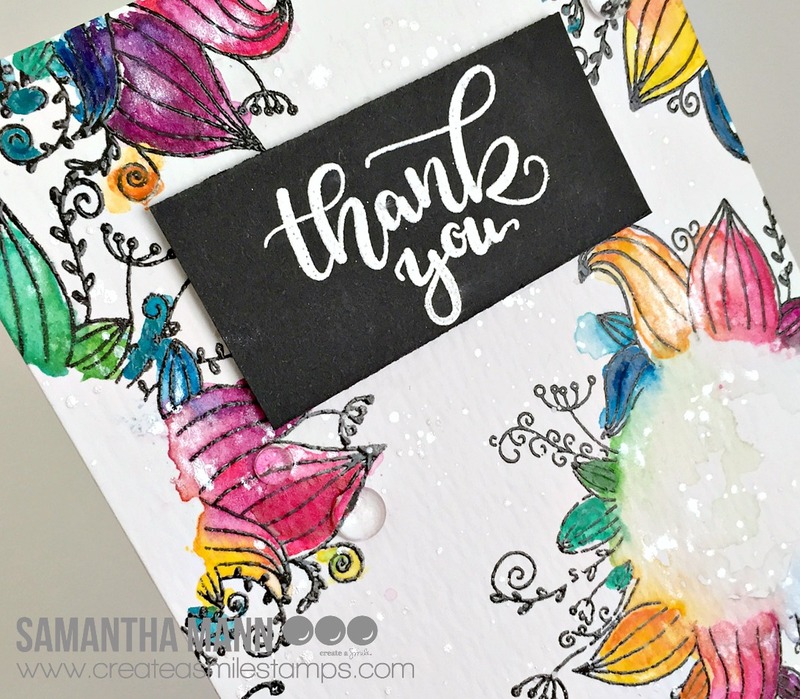 Samantha here and today I have a bright and happy Thank You card! The idea for this card won't surprise you: that stamp set is my FAVORITE and I love rainbows! Ha! You can create just as gorgeous of a card with markers or other kinds of watercolors, too! Oh that gooooorrrrgggeeeeoooouusss Decorated Wishes stamp set just has my heart! 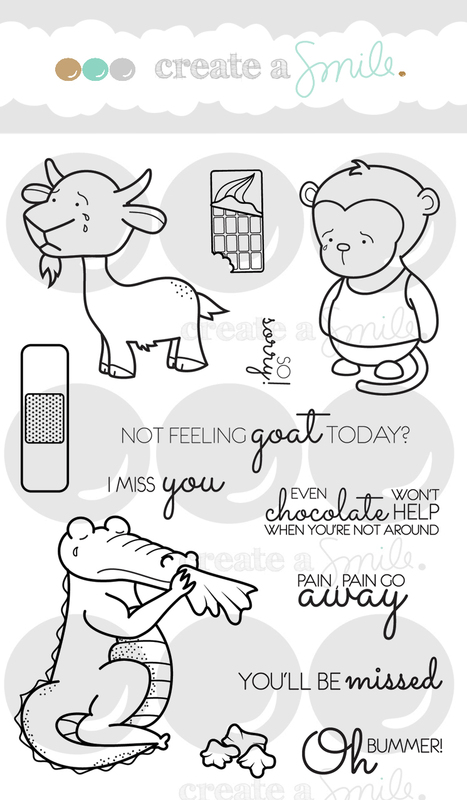 And the phrase is from the Decorated Wishes - Mixed Add on set - such a perfect companion!! 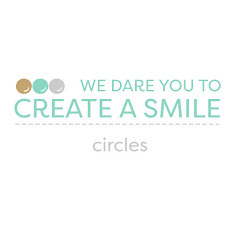 Did you know that Create a Smile Stamps is offering FREE SHIPPING WORLDWIDE for a limited time?! JUMP on that!!!!! It's such a fabulous deal!! Today I have two cards for you! I haven't used the background stamp Balloons in the Air before and I wanted to play with my ZIGs. So I made one with pink, orange and yellow, and one with blue, turquoise and green. 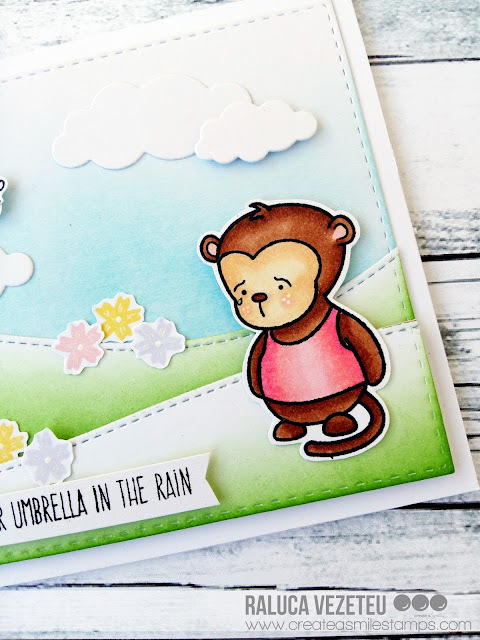 These cards are fun and easy to make! 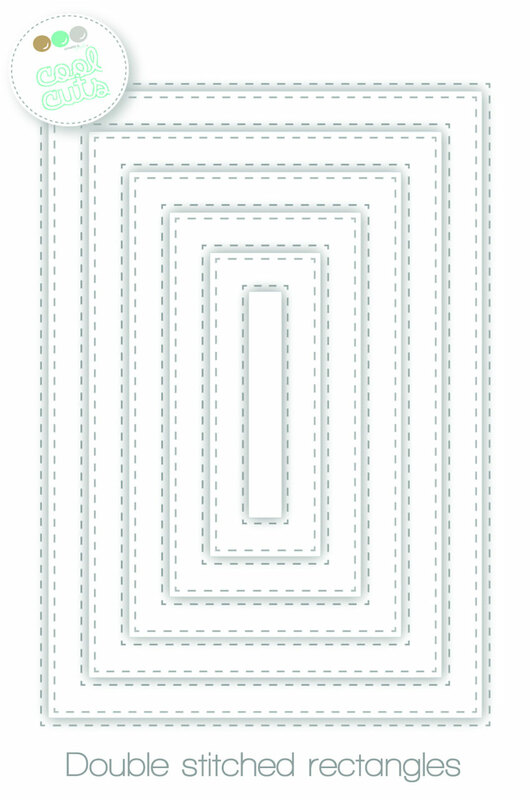 Just emboss the background, colour with water colors and die cut a rectangle from that piece of paper. 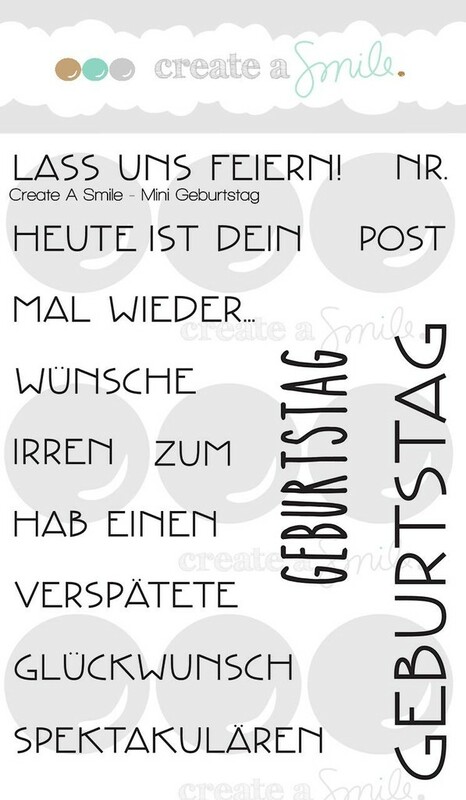 For the sentiment I used a die cut Birthday word and stamped an additional text. Then I adhered both to a stripe of vellum and assembled the card. 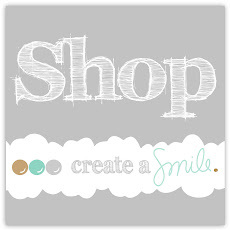 Hi crafty friends and welcome back to our crafty space. 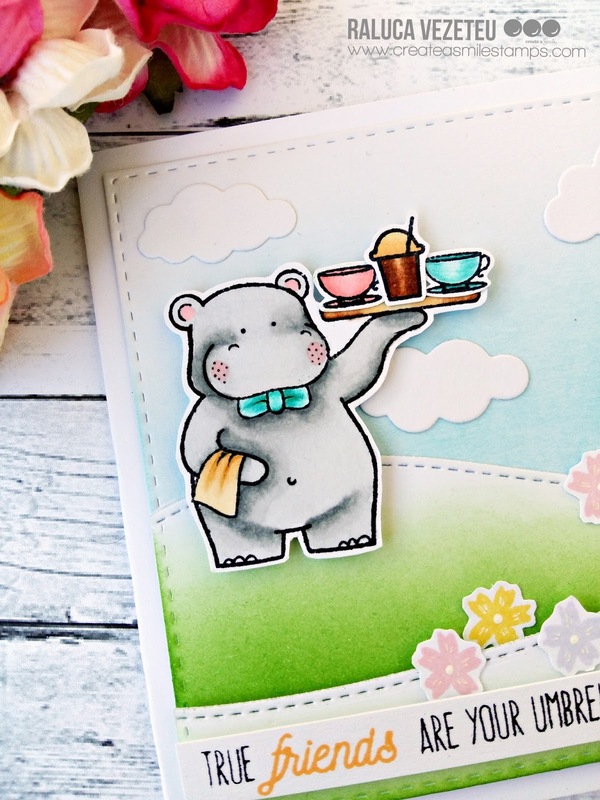 Raluca here with a new card using some cute critters stamp sets. Sometimes we have moments when we feel that the rain would never stop and the sun is gone. In those moments we find out that our friends are our umbrellas in that rain. They will protect us until better days will come. So I wanted to make a card that would show this idea that I had in my mind. First of all I prepared the background panel by ink blending some Distress Inks for the sky and grass. Then I die cut and glued a few white clouds. Next step was to stamp and color the images that I wanted to use and fussy cut them. I colored the images with my Nuvo Creative Pen sets from Tonic Studios. I also stamped some little flowers for a more springy look. Then I stamped the sentiment on a white banner. Next, I adhered everything on the panel and the panel on a white card base and my card was done. The adorable hippo knew how to make the day better for the cute, but sad monkey because that's what true friends do. I hope you'll have someone like this in your life when you'll need it and that you would also be the hippo to one sad monkey someday. Samantha here and today I'm sharing a layout! 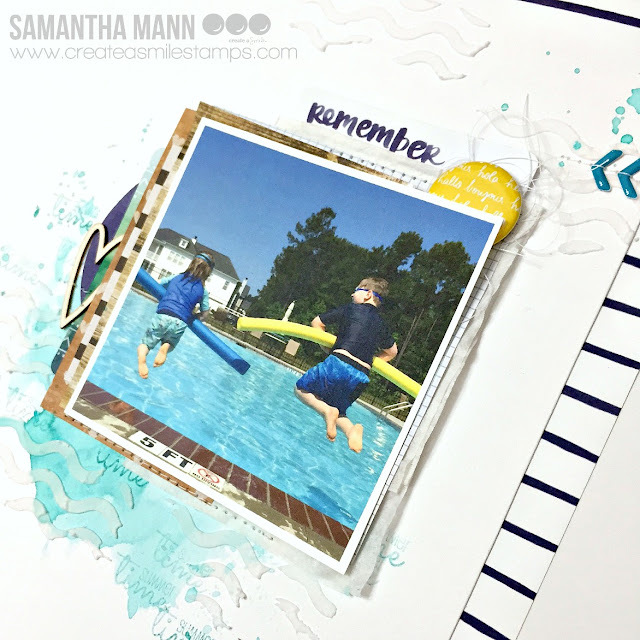 It's been a hot minute since I've created a layout, and when I came across this photo of my boys jumping in the pool last summer I knew it was time! So let's make this layout! - using Distress Inks (Peacock Feathers), I smooshed the ink pad onto a piece of old sticker packaging, spritzed with water and then smooshed THAT plastic packaging onto my white cardstock. 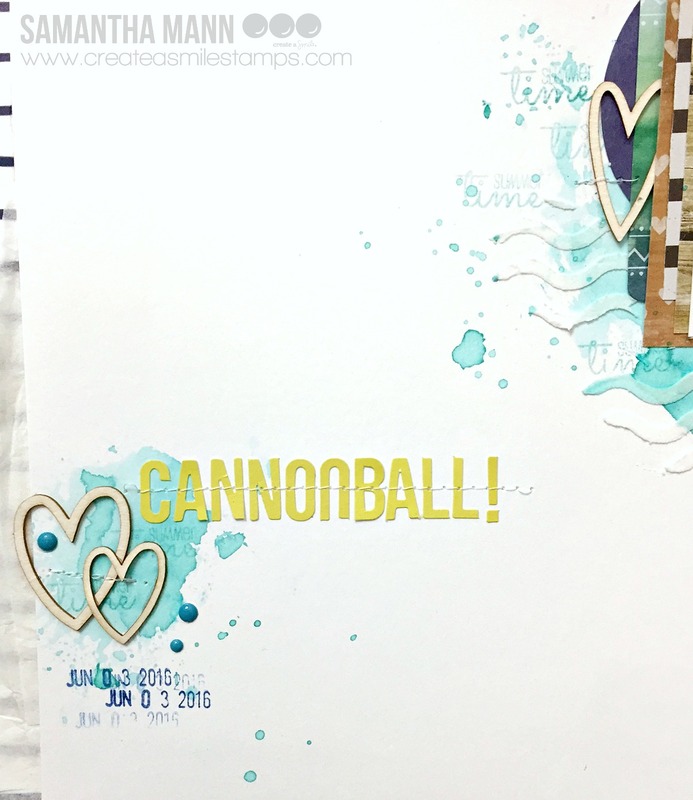 - my title uses the CUTE alphabet stickers in yellow, and I LOVE that it tucks right into that space between the two overlapping chipboard hearts! - I machine stitched a bunch of the elements, including the chevron enamel shapes! LOVE how this layout came together! 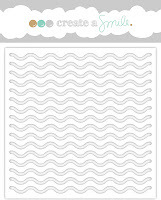 I used the Curvy Lines stencil for the faux waves! The mini stamp is from the Sending Sunshine Kit, and the letter stickers and enamel dots are from the Beach Party Kit! 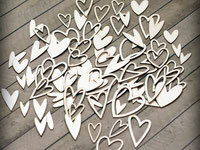 I used the chipboard Hearts as an embellishment and I LOVE them! I am in LOVE with those letter stickers! And did you know that they come in a rainbow of colors?! Who doesn't love rainbows!? Ha! Hi crafty friends and welcome to our crafty space. 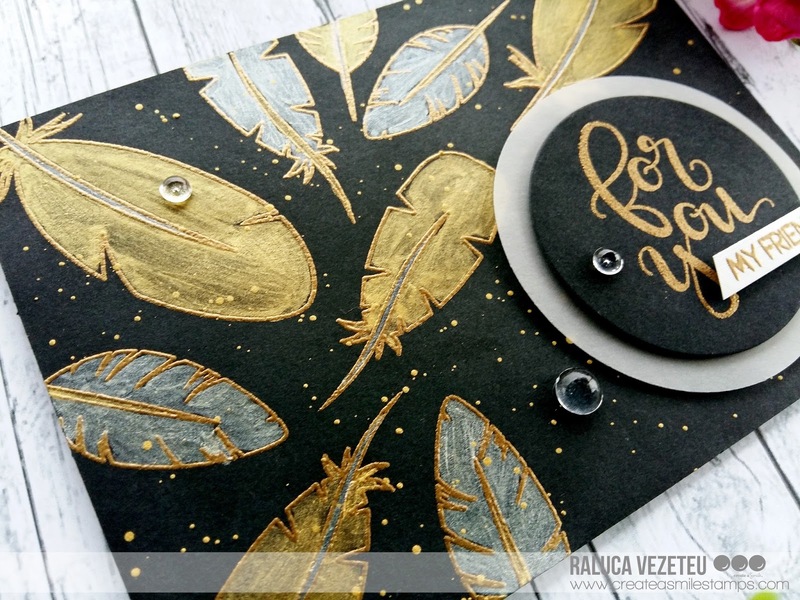 Raluca here with a new card showcasing the Funky Feathers stamp set. I really wanted to make an elegant card using this set so I decided to try coloring on black cardstock with Nuvo Embellishment Mousse from Tonic Studios. I loved how it looked so I made this card. 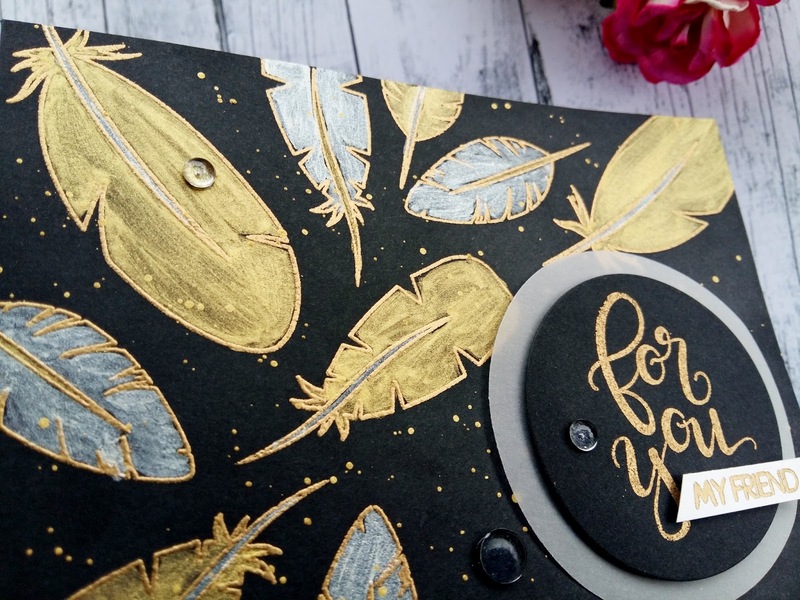 On a black cardstock panel measuring 10×14 cm I stamped in VersaMark and gold heat embossed the outline feathers. Then I took with a little spoon just a little of the Indian gold and Lemon sorbet Nuvo mousse and placed it on an acrylic block. With a wet paint brush I took some of the mousse and started coloring. Such a beautiful shimmer and so elegant result. Loved it. I colored all the feathers and then I added some splatters with the gold mousse. 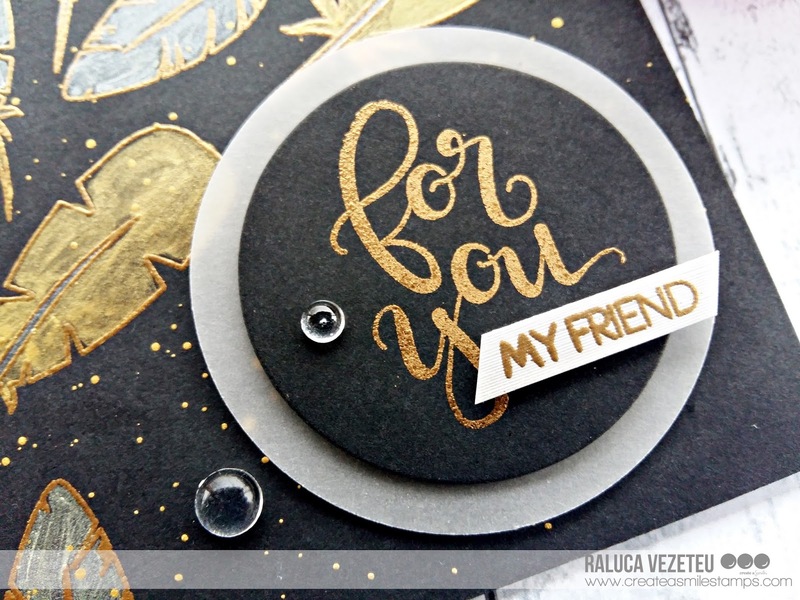 For the sentiment I used the "Decorated Wishes - mixed add-on" set and I gold heat embossed the "for you" stamp on a black circle and from the "Just Saying Hello" set I stamped the "my friend" stamp and gold heat embossed it on a white strip. I mounted the black circle with the sentiment on to a vellum circle and adhered everything on the panel. I glued the panel on a card base and added a few clear droplets and my card was done.